The STOL CH 701 aircraft is built of semi-monocoque stressed-skin all-metal construction, just like modern factory-built planes, but adapted specifically for the kit builder. The airframe sections are designed and built so that the outer surface skin is part of the structure, with internal supports (ribs, bulkheads and longerons) to distribute the loads. The parts are fastened together permanently with rivets. Sheet-metal construction is outstandingly the most widely used aircraft building method around the world, and has proven itself as an ideal aircraft building material since the early pioneering days of aviation. Modern alloys are lightweight, strong, corrosion-resistant and durable, while being easy to work with. Unlike many other all-metal kit aircraft, the STOL CH 701 kit is made for the first-time builder, and is simple and quick to build, requiring just basic special skills, tools or jigs to assemble in a small workshop, such as a single car garage or basement workshop. Designer Chris Heintz has been perfecting all-metal construction for homebuilders since 1974, giving Zenith Aircraft Company unparalleled experience and resources in providing complete kits for first-time builders, and renowned customer support to every builder. Sturdy and low-fatigue aluminum alloys make the STOL CH 701 airframe very rugged and corrosion resistant. The modern 6061-T6 aluminum-alloy used in the STOL CH 701 construction is durable and corrosion resistant, ideal for even the harshest environment, and very easy to repair and maintain in the field. The owner of a STOL CH 701 is assured of a long airframe life, with minimum required maintenance, as metal is not adversely affected by ultra-violet (UV) light and temperature changes like fabrics, Dacron or composites (its thus feasible to tie-down the aircraft outdoors to minimize costs). Developed for the novice kit builder, the STOL CH 701 may be built from component or complete kits, or even built from just the drawing and manuals. Building a STOL CH 701 from scratch (rather than the factory kit) necessitates more time, skills, and tools, requiring about 1,500 hours to build. "By all these standards and many others too numerous to mention, Zenith Aircraft Company's excellent reputation is well deserved. We heartily recommend to every prospective homebuilt kit buyer that he or she seriously consider the excellent aircraft produced by Zenith Aircraft, a company we've always found to be competently and professionally managed by genuinely qualified, dedicated people." Developed for the amateur builder, the STOL CH 701 draws upon Zenith Aircrafts vast design and manufacturing experience. The simple stressed-skin monocoque construction uses single curvature sheet-metal skins riveted to internal structural members. The sheet-metal skins, main wing spar, structural ribs, longerons, stiffeners and bulkheads are fastened together with Zeniths proven riveting method using blind rivets, which are as easy to set as pop rivets, requiring only a simple hand rivet puller. The corrosion-resistant rivets provide a permanent structural bond and tight low-profile dome finish, formed by the custom riveter head. The rivet stem becomes locked in after being set to provide a water-tight seal. 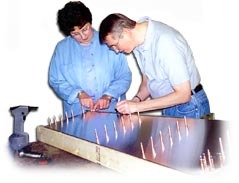 The 1/8-inch and 5/32-inch blind (or sometimes called pulled) rivets used are very sturdy and durable fasteners, and may be used over a wide grip area. The blind rivets are much easier and quicker to set than bucked rivets, and dont require the use of a noisy pneumatic rivet hammer or counter-sunk rivet holes. "They go together predominantly with aircraft-grade pull-stem rivets, which together with the simplicity of the design make for kits that can actually be assembled in a few hundred hours." The sturdy main wing spar is a built up I-beam, with cap extrusions buck-riveted to the spar web. In the kit, the spar comes completely pre-assembled and finished (drilled and riveted, with flanged lightening holes). The rib stations on the spar are even pre-drilled - ready for final wing assembly. 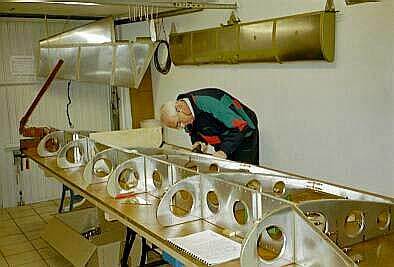 The structural aluminum wing ribs and fuselage bulkheads are supplied ready-to-install (pre-formed and finished at the factory with flanged lightening holes). The surface sheet-metal skins are blind riveted to the spar, ribs and bulkheads. Many flat surface skins are pre-drilled at the factory with a drilling machine, and are pre-formed and cut, ready for assembly. The STOL CH 701 is one of the few kits on the market that doesnt just come with assembly instructions: The kit includes detailed blueprints of every part of the airframe, as well as a detailed assembly manual. In fact, the STOL CH 701 can be scratch-built from the Drawings and Manuals, although this requires additional skills, time and tools. The semi-monocoque rear fuselage requires the same type of simple assembly as the wings. 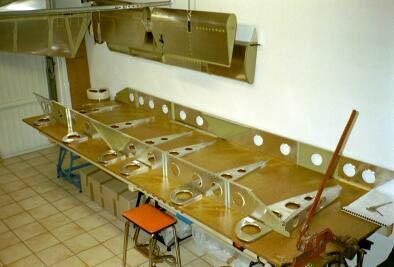 The square rear fuselage is easily assembled by assembling each side on a flat workbench and then simply boxing the four sides together. The forward fuselage (cabin) is made up of factory-riveted lower side frames, and and a welded 4130 chromium-molybdenum steel top frame. 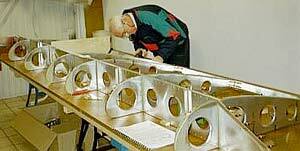 Fuselage and cabin parts are supplied ready for assembly as standard components of the complete kit. The horizontal stabilizer tail is built up of two spars and internal ribs, covered with the pre-formed aluminum-alloy skin. The elevator is fabricated like the ailerons, and attached to the stabilizer with pins at each end. The pre-formed vertical tail skins cover the internal spar and ribs. The standard fuel system is made up of dual welded-aluminum fuel tanks (10 US gallons each). "Attention to small details ensures that the kit can be easily completed within the 400 hours claimed for the homebuilt kit version. For instance, the ribs are not only shaped, but the lightening holes are made, beveled and smoothed to a finished state. Look at other kit manufacturers for this attention to detail. The builders of some of the 700 flying Zenair planes Ive had a chance to interview tell me the company time estimates are valid and the support is unsurpassed." Metalworking 101 is a new two-hour DVD that covers the complete assembly of the STOL CH 701 rudder starter kit. Independently produced by a STOL CH 701 builder, the DVD provides an excellent introduction to getting started on your own STOL CH 701 kit project... the next best thing to attending a factory workshop. The DVD makes an excellent companion to the rudder starter kit.